Seniors Charles Scarff and Vinny Papale celebrating in between plays at game against Lafayette. The Blue Hens avenged their tough loss last week with a dominant performance over Lafayette College, winning 37-0. The defense was stout in Saturday’s game, posting their first shutout in a non-conference game since 2011 against Delaware State University. It came a week after the Blue Hens lost to Rhode Island, who entered the season ranked last in the CAA, 21-19. “Defensively it’s hard to pitch a shutout,” Head Coach Danny Rocco said. The defense only allowed 118 yards and held Lafayette to -18 rushing yards. Turnovers played a key role in the Blue Hens victory. The Blue Hens forced four turnovers — two fumble recoveries and two interceptions — and scored 14 points off of turnovers. “We were very opportunistic with our turnovers,” Rocco said. Senior captain linebacker Troy Reeder led the team in tackles with eight and a forced fumble which was recovered by Armen Ware. Senior safety Nasir Adderley was all over the ball, forcing key plays at pivotal points in the game. 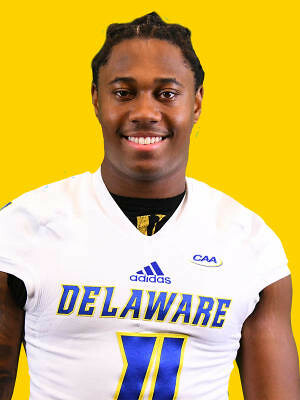 Adderley recovered a fumble punted by Lafayette which then turned into a Blue Hens touchdown to give them a 14-0 lead in the first quarter. Adderley later intercepted a pass in the end zone in the 4th quarter. “On defense we pride ourselves on takeaways … which gives the offense a boost,” Adderley said. The offense received a boost from sophomore running back Dejoun Lee. He gained 93 yards on 11 carries, including a 35-yard run. Lee averaged eight and a half yards per carry to lead the team. Lee utilized his explosiveness and speed to get through the hole provided by the offensive line, providing a change of pace compared to starter Kani Kane, who is a more physical runner. “He is uniquely different than Kani Kane and Khory Spruill,” Rocco said. Kane and Spruill both scored touchdowns from inside the 10-yard line. Redshirt junior and quarterback Pat Kehoe finished the day 18-of-28 for 279 yards and three touchdowns. He is the first Delaware quarterback with back to back 200 yards games since Trent Hurley did it in 2014 against Colgate and James Madison. Kehoe completed passes to nine different receivers — the most since 2011. “We have a lot of weapons … I just let those guys on the edge make plays,” Kehoe said. One of those nine different receivers was freshman tight end Bryce De Maille, whose first career catch went for a touchdown. The three senior starting pass catchers, Vinny Papale, Charles Scarff and Joe Walker combined for 185 receiving yards. Papale and Scarff each caught touchdowns. “We finished very strong this week … and I think we forced them [Lafayette] to be on their heels a little bit both offensively and defensively,” Rocco said when comparing the game to last week’s loss against Rhode Island. The Blue Hens played close to a complete game on Saturday. The team will look to start a winning streak when they take on Cornell at 3:30 p.m. on Saturday, Sept. 15 at Delaware Stadium. 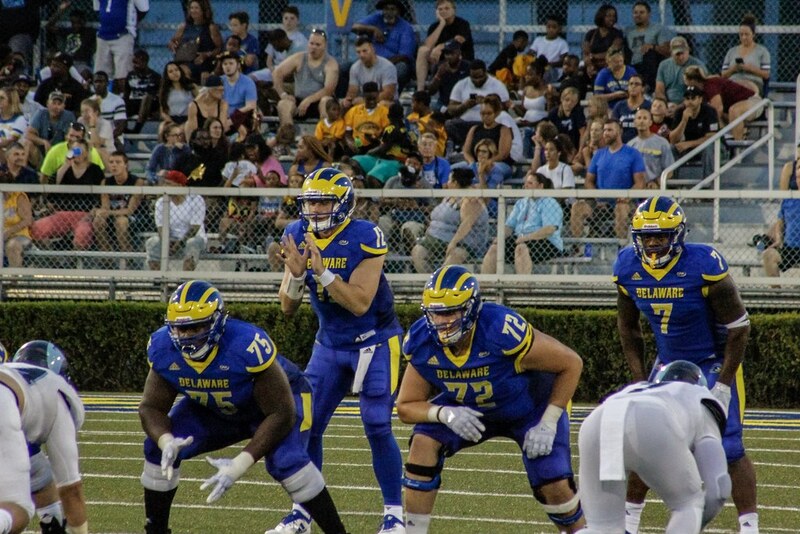 Redshirt junior Pat Kehoe plays his first two games as starting quarterback for the Blue Hens. Boston College transfer and Delaware native Darius Wade returns home to play his final season as a Blue Hen.